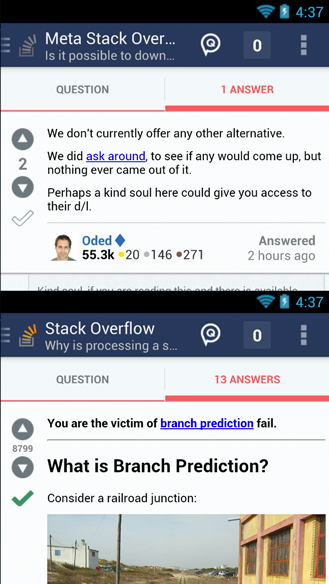 I am viewing one of my own questions, which has an accepted answer, in the Android app. It was a bit confusing and I had to confirm on my PC which answer was the accepted one. Could this distinction be more clear? Perhaps simply no checkmark for the non-accepted answers? As of version 0.1.43 which came out earlier last week, here's what the accepted and "accept" buttons look like. The top view is the owner of a question looking at an answer that hasn't been accepted yet, the bottom view is anyone looking at an answer which has been marked as accepted.